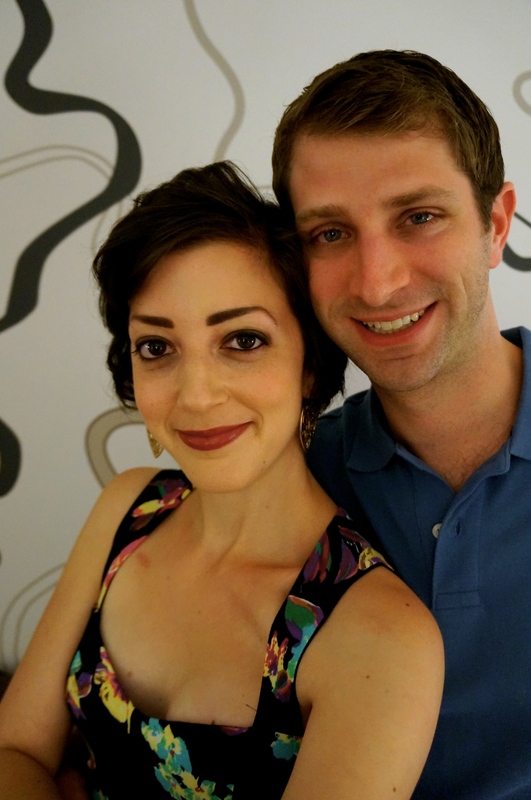 To celebrate my quickly approaching 30th birthday, the Hubs and I recently took a little trip to New York City, which is easily one of our very favourite cities in the whole world. There really ain’t nothing else like the Big Apple. Anyone who has ever been to NYC will always tell you the “things to see” and the “places to eat” and all the many sights you absolutely cannot miss, and the list varies greatly depending on the person and what he or she likes to do. That’s the great thing about New York — no matter what type of person or traveler you are, there truly is something for everyone. If you can’t find something you like in NYC, then I’m pretty sure you won’t be satisfied anywhere, ever. For me, the city is all about food and culture. Those are the things that get me excited. Our first evening, we planned to see a Broadway show, so our food options were limited since many Broadway-area restaurants are tourist traps with terrible food. 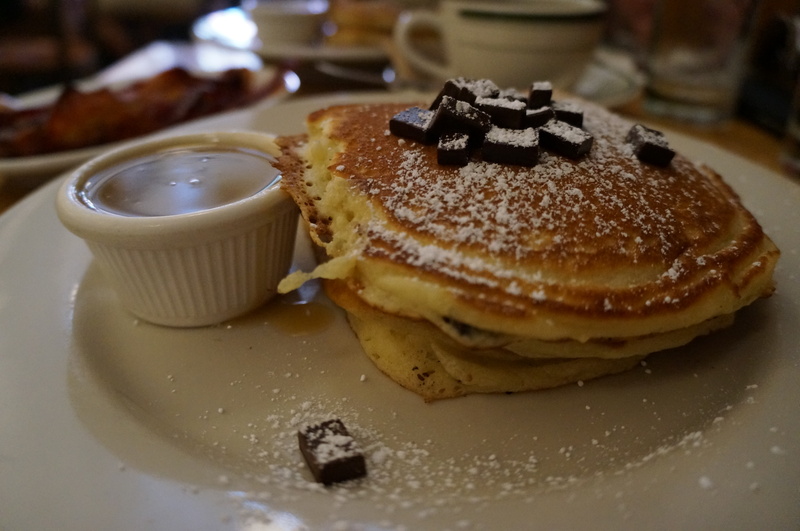 We headed over to Cafe Edison, a place that we have gone every single New York trip we’ve taken together. Cafe Edison is really nothing out of the ordinary, and I’m not sure it’s a place that would excite or appeal to the average diner. But for me, it is pure comfort, serving up Eastern European Jewish cuisine, at extremely reasonable prices, considering you’re in a neighbourhood that is known for its exorbitant markups on average food. 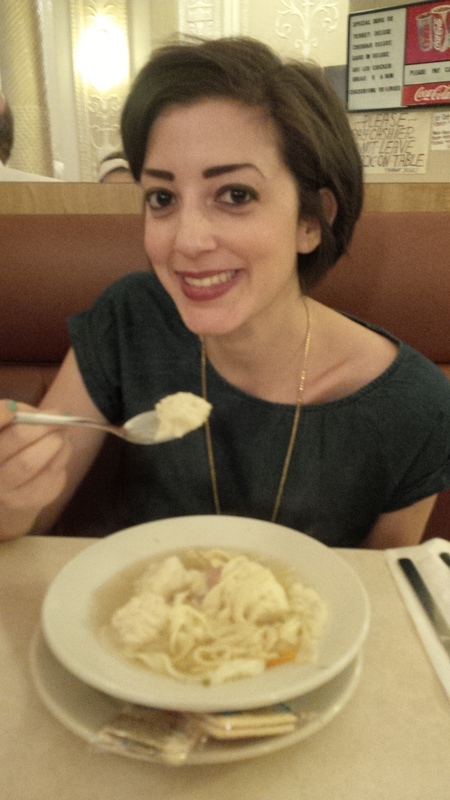 I always make sure to order the matzah ball soup when I am at Cafe Edison. The matzah balls are huuuuge and the noodles are plentiful and it is like being wrapped up in a warm hug. The soup also did double duty on this particular visit, as I was fighting off a nasty cold, and what better cure is there for sickness than homemade matzah ball soup in the heart of New York City? I can think of none. After stuffing ourselves (I also had a chicken salad platter, consisting of a huge mound of chicken salad, egg salad, coleslaw, egg, and veggies), we then made our way down the street to our Broadway performance. I don’t think I’ve ever been to New York without seeing a Broadway show and for me, it is one of the most “oh, right, I’m in New York City” experiences I can have. I become like a child when I see all the glimmering lights from the marquees, with stars in my eyes as I walk along the sidewalks and watch all the crowds spill into the theatres. It’s truly magical. 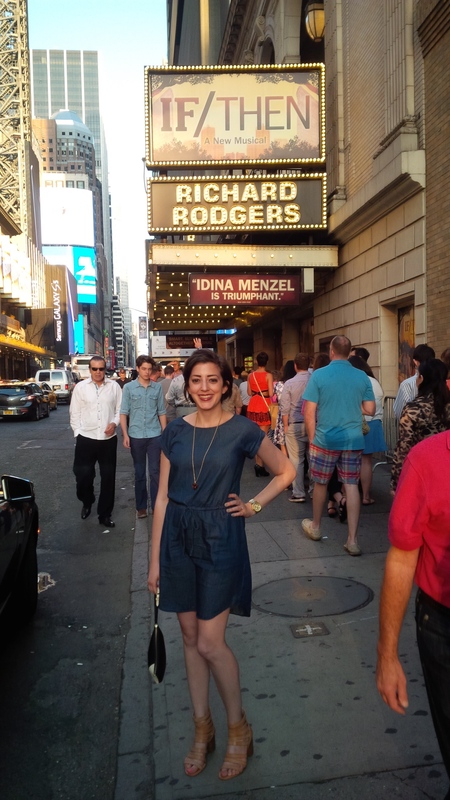 This time around, we got tickets to see the new musical “If/Then” starring Idina Menzel. If you don’t know who Idina is, you’re probably living under a rock, especially after that whole Adele Dazeem fiasco. I have been a huge fan of hers for a loooong time, since she first starred in the original cast of the musical “RENT” when I was a little pre-teen, obsessed with all things musical-related. This was my second time seeing her on Broadway and I was once again blown away by her incredible talent and sheer force. Her voice is truly unparalleled. If I could sing like that, I wouldn’t even bother ever talking. I would just sing, every word, all the time. If only. After the show, I thought, hey, why don’t we go to the stage door and say, “What’s up Idina!” It seemed like a quaint thought. 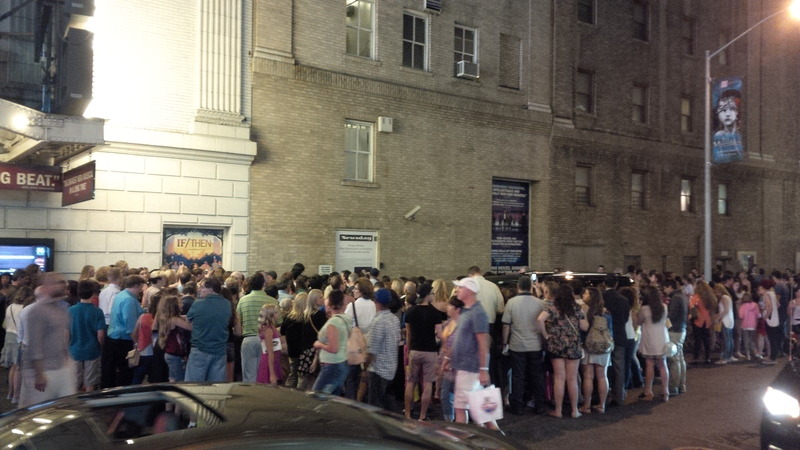 But apparently half of the city had the exact same brilliant idea, as a huge mob crowded the stage door, waiting for Queen Idina to emerge and jump into her SUV. We stood around for awhile, thinking maybe at least I could catch a glimpse, but she took her sweet time and we decided to bail. After all I am almost 30, which is probably a bit too old for such foolishness. Ah well. 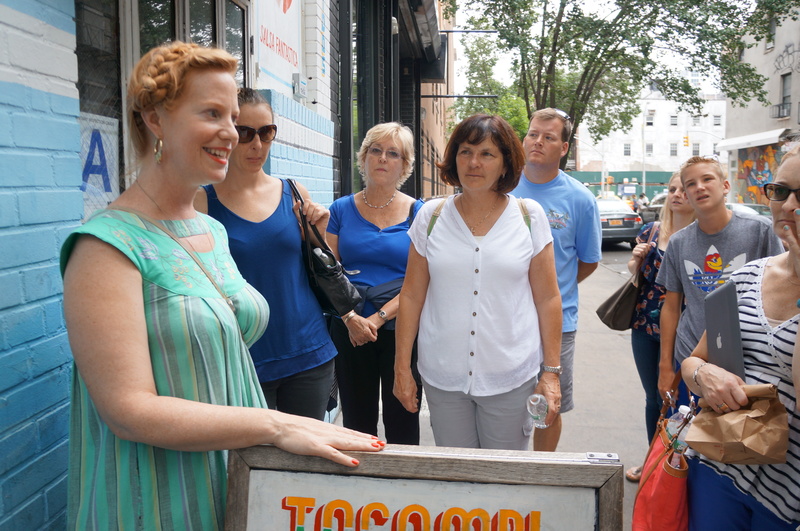 The next day, we took a food tour of Nolita (North of Little Italy). 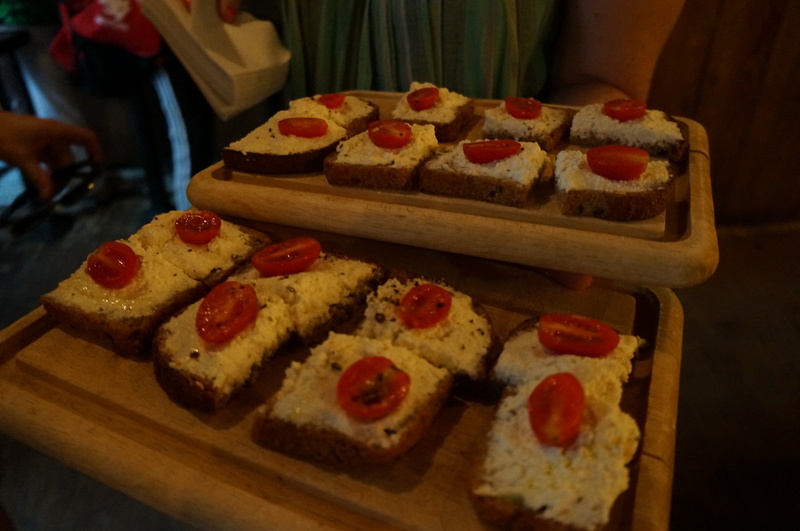 If you’re asking yourself, What the heck is a food tour?, well, it is a tour where you eat food the entire time, i.e. THE BEST IDEA IN THE HISTORY OF ALL IDEAS. 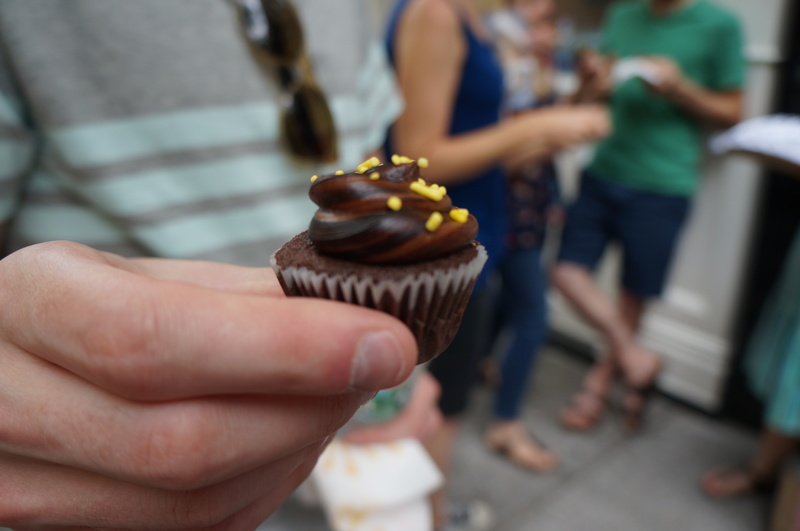 This was my third tour through Foods of NY and I have loved every one. 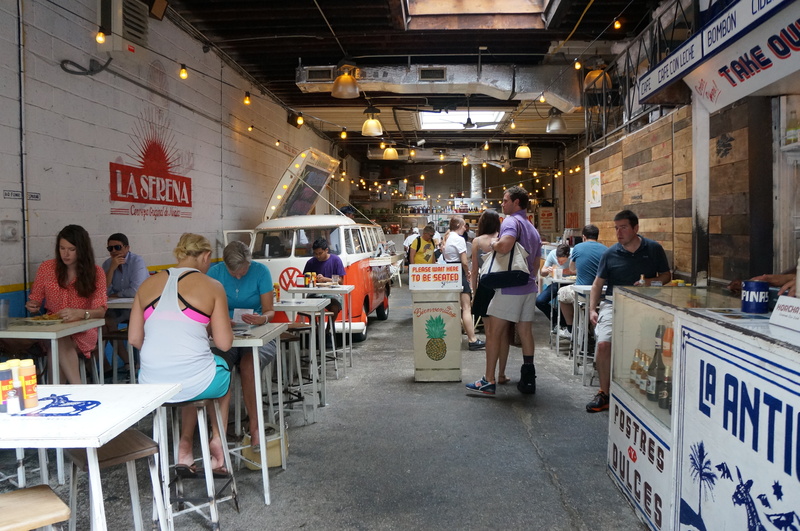 The guides are always amazing, you get a great history of the area you’re exploring, and you get to discover all sorts of hidden New York gems. Our guide this time was a lovely woman named Annie, and I would have taken her home with me if that sort of thing was offered/acceptable. She told me to give a big hug to all of Canada, so to all my fellow Canucks out there – you have been hugged. Annie, our adorable and informative guide. 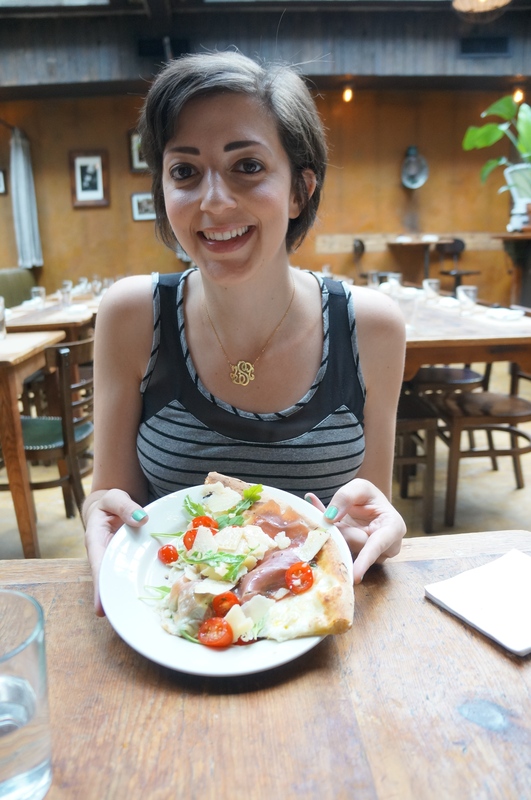 Second taste: super fresh brick oven pizza made with mozzarella, arugula, prosciutto, heirloom tomatoes, grana padano cheese… my fave stop of the tour. Very happy to be eating pizza for breakfast. 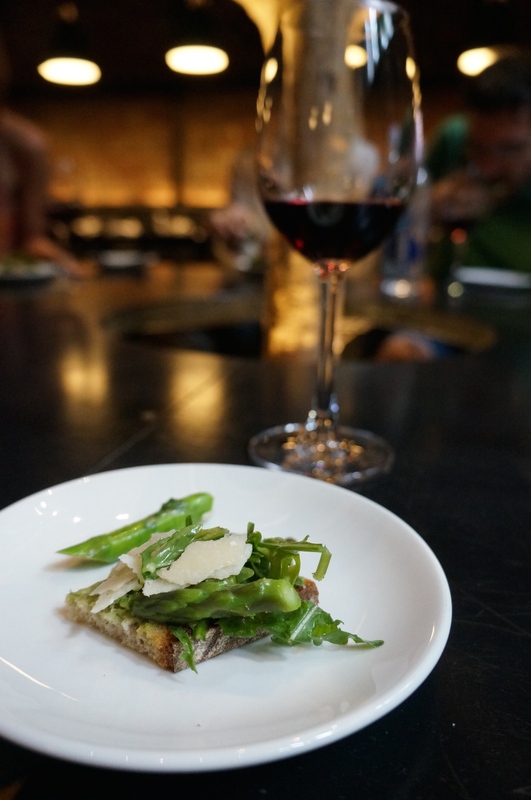 Third taste: Avocado, asparagus, parmesan cheese on fresh baguette flown in from Paris, avec vino. VW bus transformed into a taco stand. 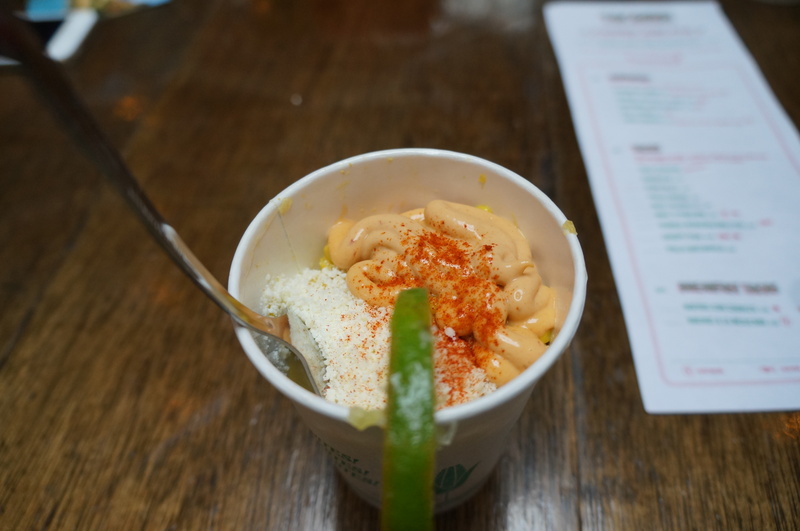 Fourth taste: toasted corn with lime, cotija cheese and spices. 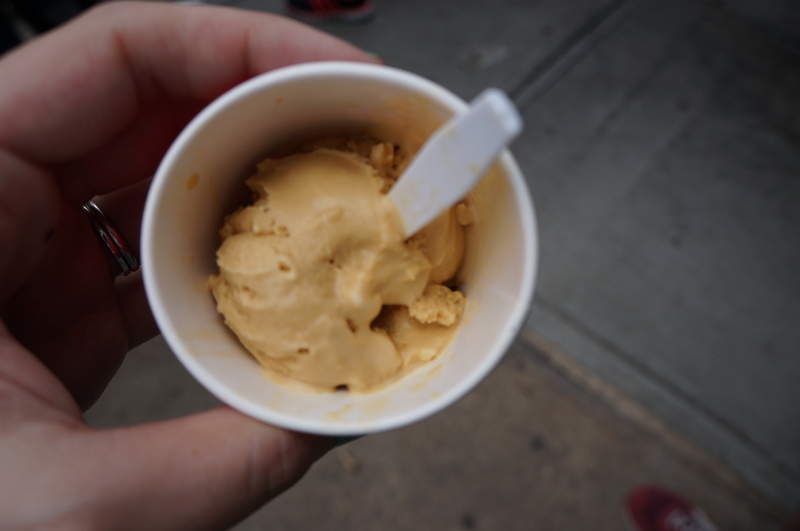 Final taste: housemade salted caramel gelato. After the food tour, we walked a bit around Soho and then headed back to our hotel for some downtime, because that much walking and eating deserves a nap. It was during this time that I learned we had been selected to receive two tickets to that night’s Shakespeare in the Park, via the online lottery I had entered that morning. Woohoo! Shakespeare in the Park is a quintessential NYC summer experience, where brilliant actors perform a Shakespeare play in an outdoor theatre in Central Park. Best of all, the tickets were FREE and we didn’t have to wait in line for them because I entered (and won) the lottery. 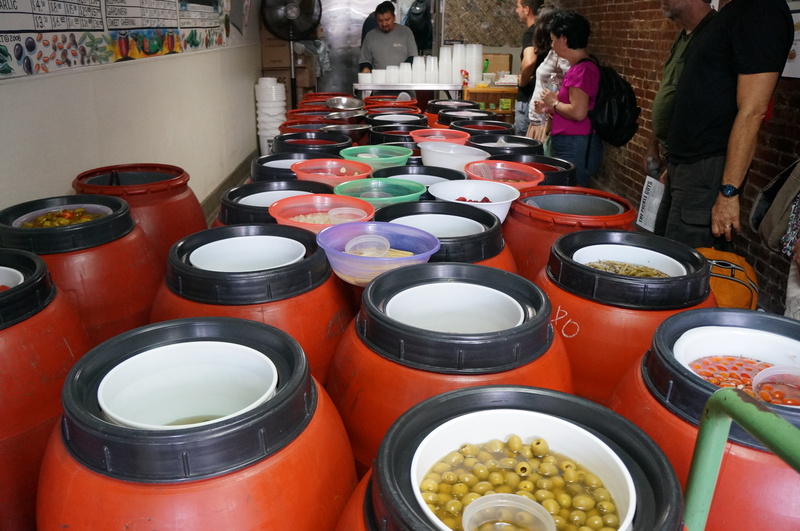 So while all those other suckers were standing in line for hours that morning, we were galavanting around Nolita, stuffing our faces full of cheese and gelato. I was extremely happy at how that all worked out. 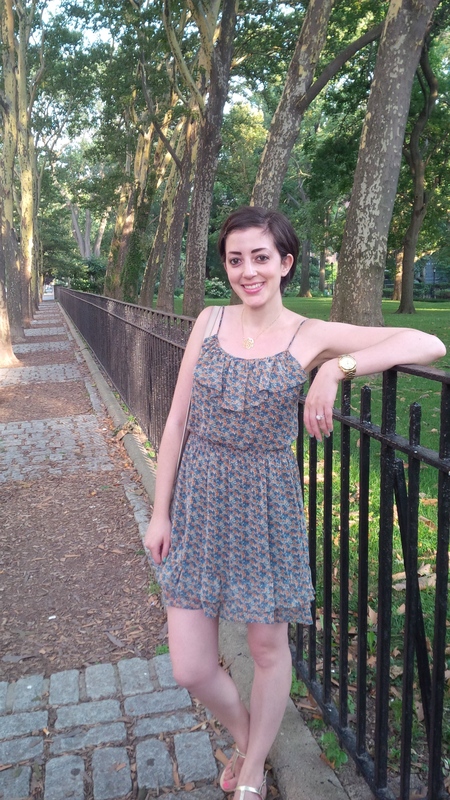 We hopped in a cab and headed up to the upper west side of Central Park to retrieve our tickets. We then made our way over to Shake Shack, which is always a necessary stop for any trip to NYC. I always get the exact same items: Shakeburger, cheesy fries, and a lemonade. And as always, this meal did not disappoint. Oh boy, was I happy. Then back over to the park to see the show. The performance currently running is King Lear, starring the unbelievable John Lithgow. I am a huge fan of Mr. Lithgow’s and was extremely excited to see his take on Lear, as well as the fabulous Annette Bening in the role of Goneril. 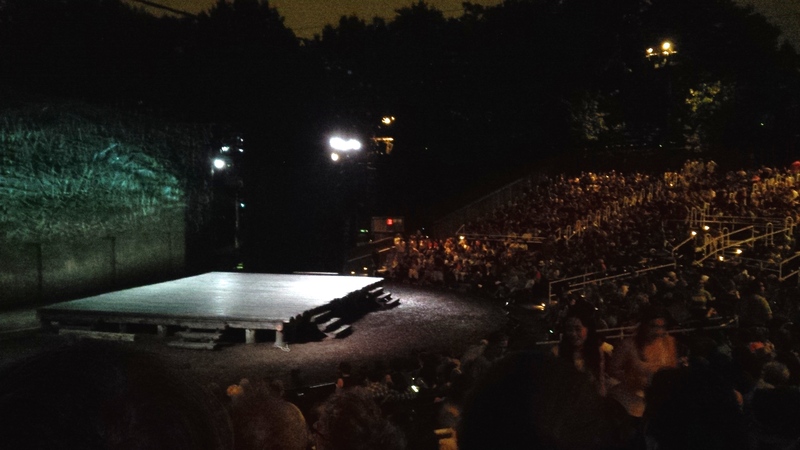 The cast were all amazing, and it was really fun to get to experience Shakespeare in the Park. 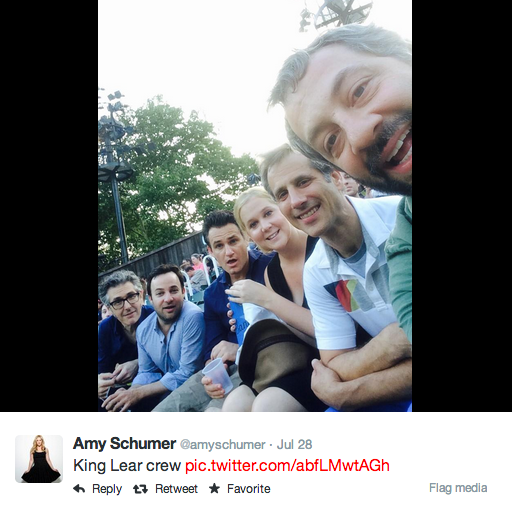 We were actually in quite good company, as comedian Amy Schumer and Judd Apatow were in the audience as well. We did run in to some rough moments during the performance, as the weather was extremely hot and sticky which can be a bit of a struggle when one still has to deal with cancer-related hot flashes. It also started to pour during the final act, sending some of the wusses in the audience running. But we persevered, and I actually enjoyed the pathetic fallacy of the rain with the dramatic finale taking place on stage (oh man, my high school English teacher would probably be so proud right now). No photos allowed of the actual show, so this is the best we could do. 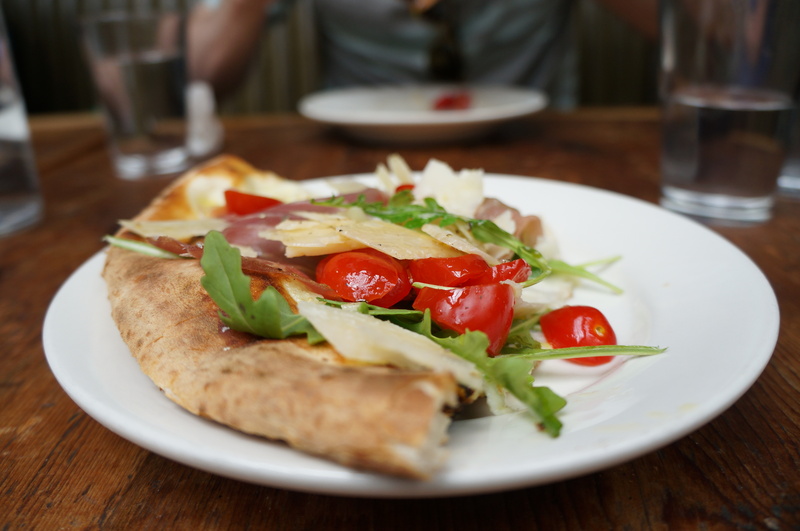 The next day, we kicked off the day by… EATING MORE FOOD. Duh. 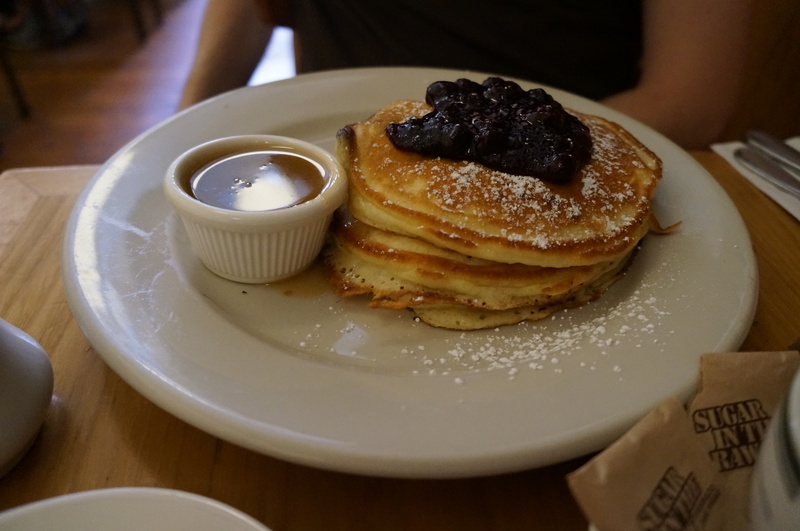 We made our way down to the Lower East Side for Clinton Street Baking Co.’s famous pancakes. The wait was an hour, and oh boy, was it worth it. I’m not even such a big pancake person, and never order them for breakfast, because a plate of just pancakes can be really disappointing. However, these pancakes are on a whole other level. Moist and fluffy and perfectly cooked, with the most delicious side of maple butter to truly put them over the top. I ordered the chocolate chunk (obviously), and the Hubs ordered the Maine blueberry. 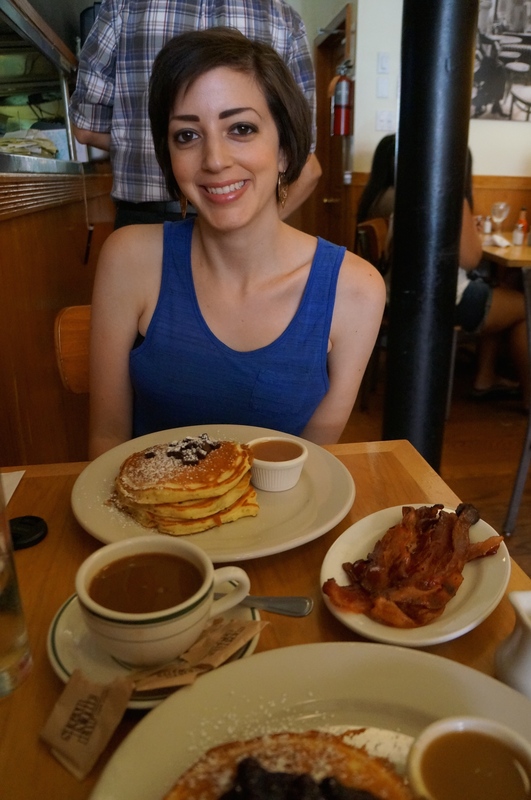 We both talked about the pancakes the whole time we ate them – the true mark of a good meal. And of course we had to add a side of the famous sugar cured bacon. This combo was essentially my dream. If sugar is wrong, then I don’t wanna be right. Then it was time to resume walking, in order to stave off the looming threat of obesity, due to our over-consumption. 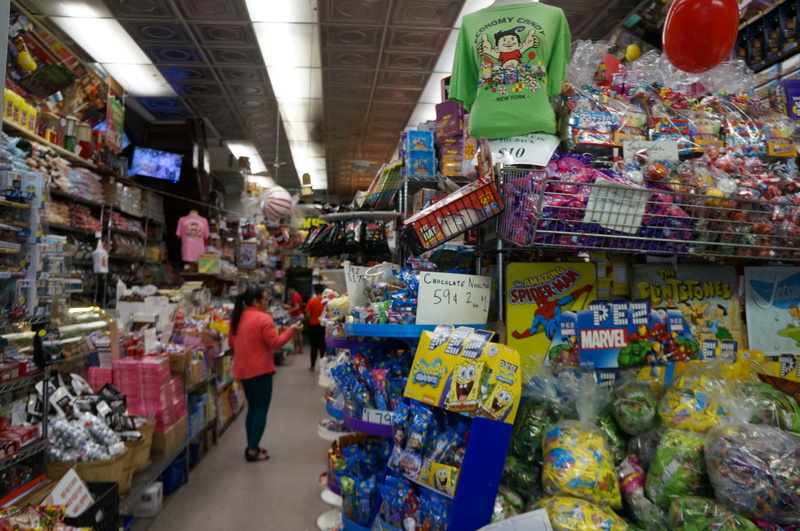 On our stroll, we popped into Economy Candy, a candy store from the 1930’s that literally has any and every type of candy you could ever imagine. I actually didn’t buy a single thing, not yet ready to think about candy after my pancake binge. 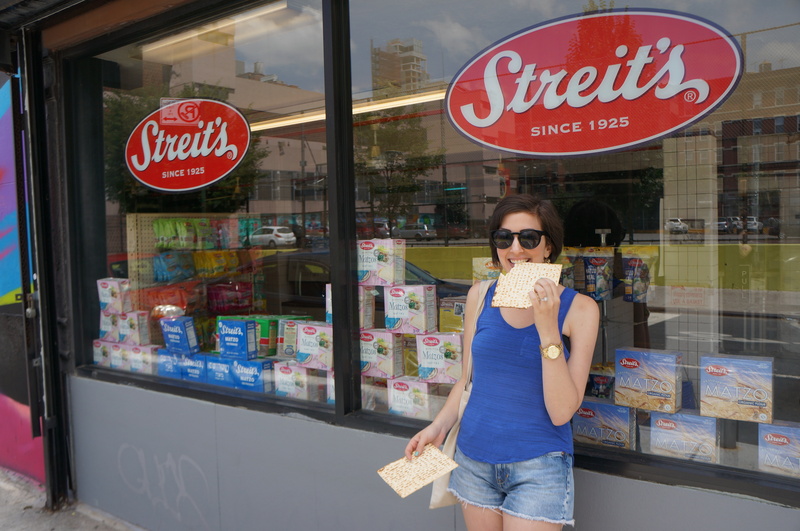 Then we continued on, and stumbled across Streit’s, the matzah factory. This was a fun unexpected stop and a really nice little piece of Jewish history that I didn’t even know existed. 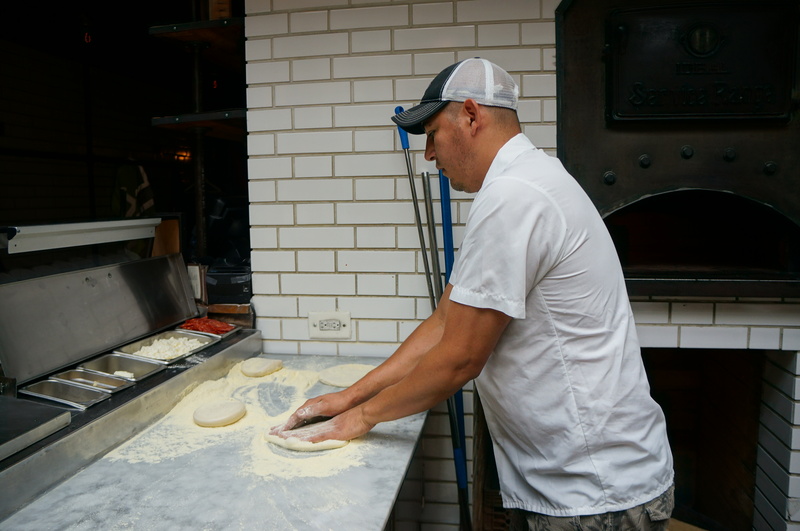 The kind man working the counter humoured my questions (“Do people seriously like eating matzah all year round?” Answer: “Yes.”) and even gave us some piping hot matzah, fresh out of the oven. I don’t really like matzah all that much, but I didn’t tell the matzah man because I didn’t want to let him down. Next, we found ourselves in front of a little shop called The Pickle Guys, run by a really nice guy named Alan Kaufman. 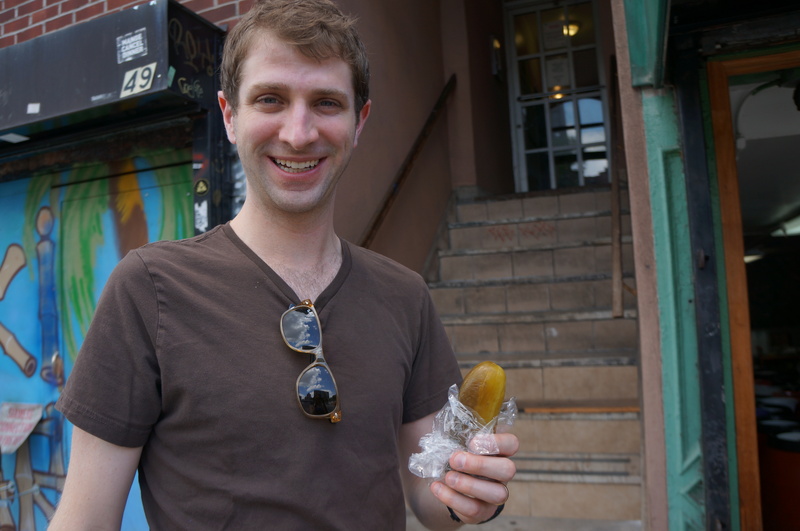 We bought a single sour pickle from Alan since we couldn’t really stomach much more than one. But that one pickle was absolutely delicious and delightful, and now I really wish I had an entire jar. Mmm pickles. 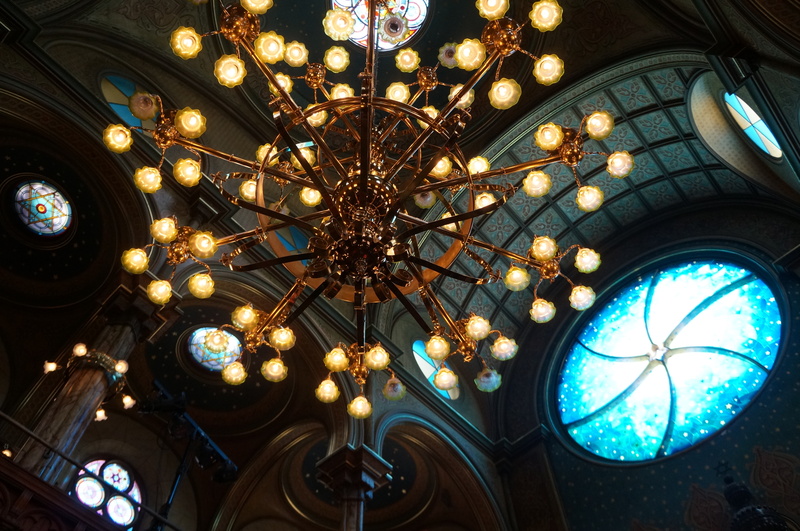 Then, because clearly this trip hadn’t been Jewish-themed enough, we went to the Eldridge Street Synagogue, a National Historic Landmark that offers tours where you can learn about the history of the synagogue and its struggles and restoration. 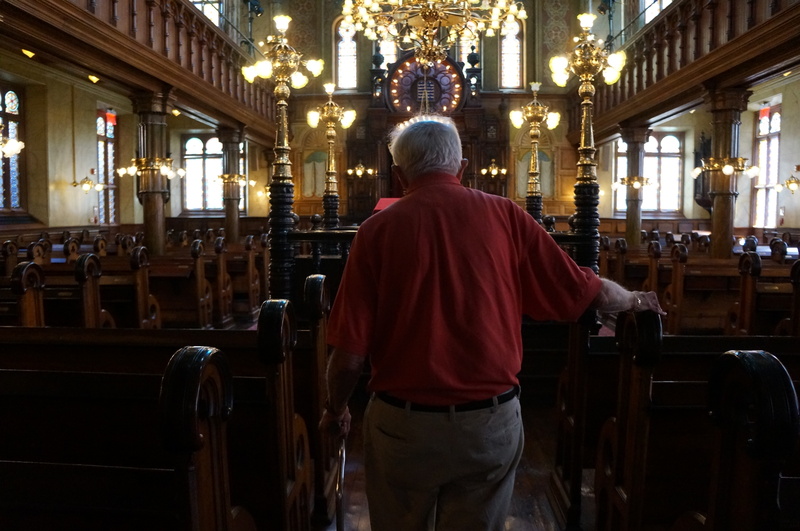 I won’t bore you with all the details, but the story behind this place was so interesting to learn about and a really fascinating chapter of Jewish life in NYC. We were so lucky to have a great guide by the name of Mel, for just the two of us. 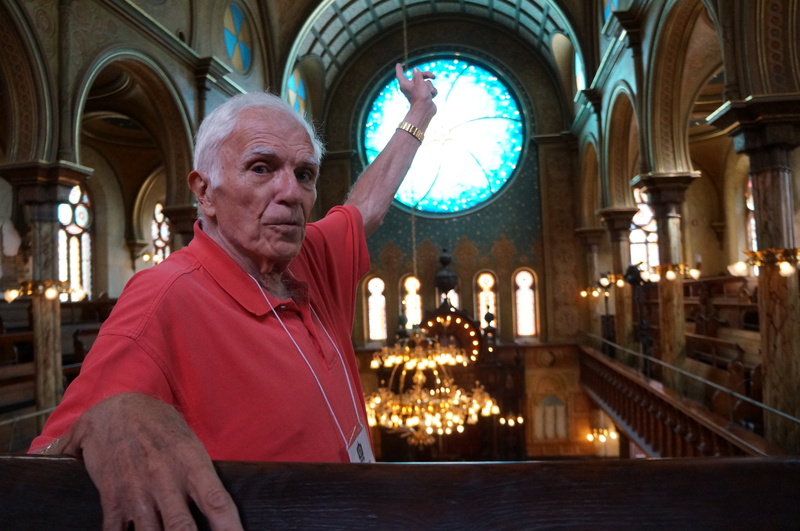 Mel shared many amazing stories with us and gave us a real glimpse into the past of NYC and the area and the building. He kept making jokes and trying to trick us in that wonderful funny Jewish grandpa kind of way. We loved him. Mel also told us that he grew up just about a mile away from where we were, which was really neat. This guy was a true New Yorker, through and through. 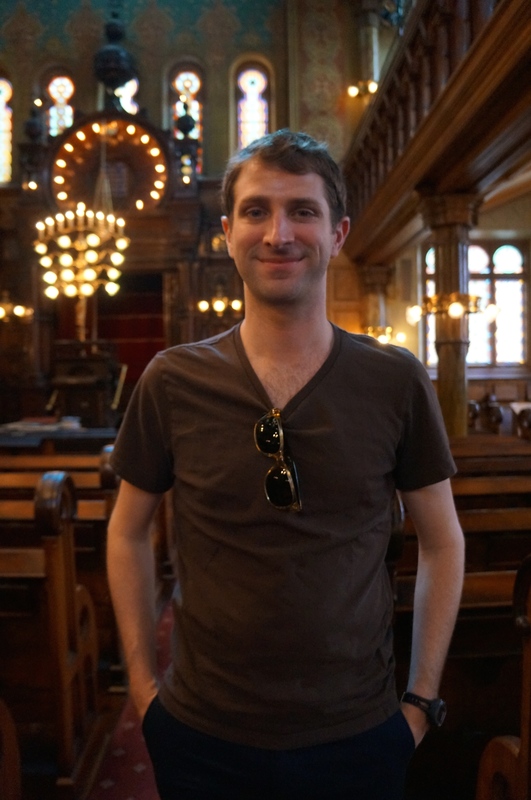 Oh, did I mention that this synagogue was absolutely beeeeeeautiful? It was breathtaking. If you’re in the area, you should stop by and see it, because it really is something special. 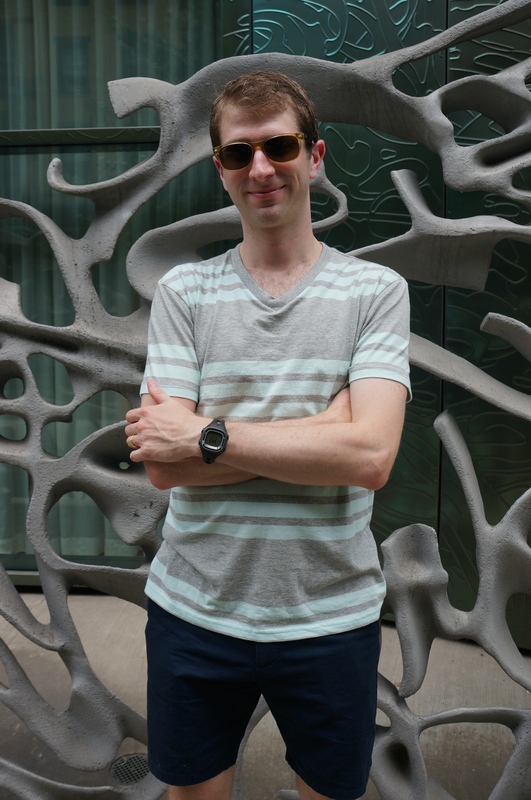 When we got back to our hotel, I went out on my own to try to do a bit of shopping, but I failed miserably, since I was completely exhausted from walking around in the heat all day. The only thing I ended up buying was a 99 cent slice of pizza. So, really, not such a failure after all. 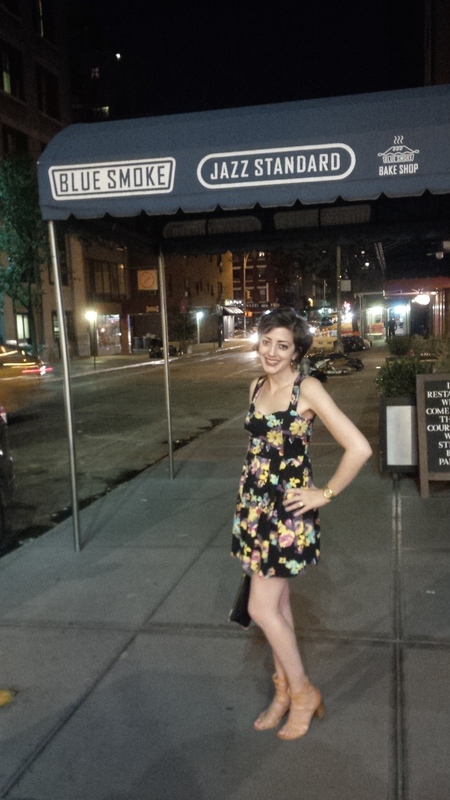 After a bit of a rest, we made our way to the Jazz Standard in Gramercy. All dressed up with somewhere to go. 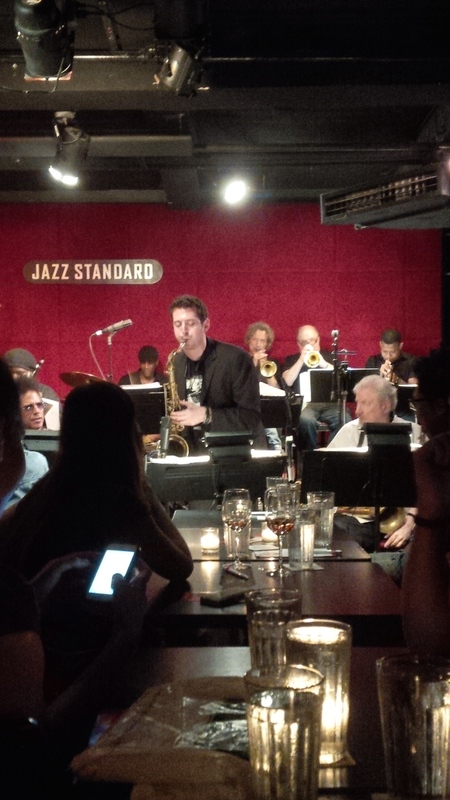 Monday nights at the Jazz Standard feature their famous “Mingus Big Band” celebrating the music of Charles Mingus. This band was craaaaazy and a lot of fun to watch. I was bopping my head and tapping my knee like some sort of spastic nut. The Jazz Standard also serves BBQ from their restaurant upstairs, so we got to listen to music while dining on fried chicken and brisket. BBQ + frantic jazz = a winning combo. Big time. The next morning, before we had to leave for our flight, we hustled over to Ess-A-Bagel, maker of delicious, chewy, perfect New York-style bagels. 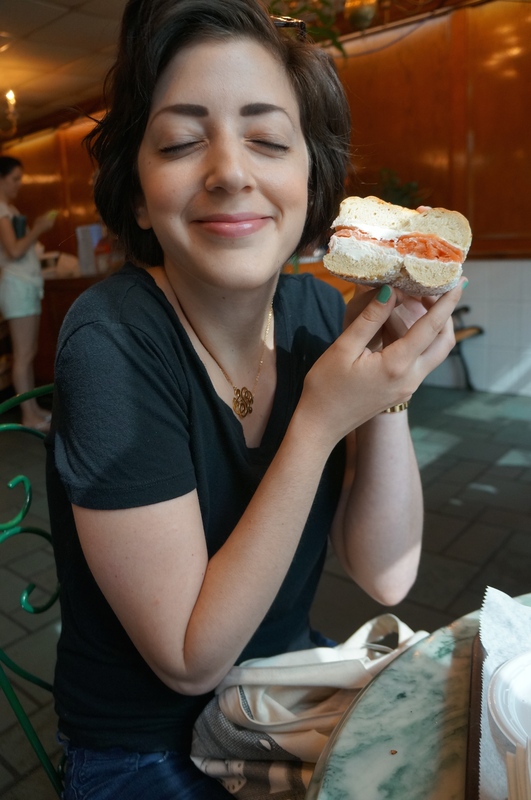 I ordered a salt bagel with cream cheese and nova lox and IT WAS HEAVENLY. I was getting really concerned about not having had a bagel the entire trip, so I’m really glad I managed to squeeze one in. I ate the entire thing and spent the rest of the day guzzling water to try to counteract the massive sodium intake. Worth it, though. So worth it. I sure do love me some bagels. Then we moseyed on over to the airport to catch our plane back home, with our stomachs and hearts happy, and already discussing when we’d be able to return. Oh, New York. I love you.